It was May 25, 1945. I was eighteen, a Gunner's Mate striker serving aboard the USS Callaghan (DD-792) off Okinawa, where we were protecting the many amphibious ships and doing gunfire support for the troops fighting ashore. We had been at general quarters for hours as Japanese aircraft carried out repeated air attacks. The weather was very bad, hot with heavy rain showers, low clouds, and poor visibility. Suddenly, two twin-engine bombers popped out of the clouds a couple of miles ahead of us, and we knew they were the enemy. Ordinarily, we waited for our guns to be set on automatic director control before opening fire. This time, the planes that looked like "Bettys" were in sight and coming in fast, so we fired immediately on manual control, quickly setting both on fire. One turned away and disappeared smoking into the clouds. The other plane headed right for us, passing just above the ship, and crashed into the sea. Luckily, its bomb did not explode, and we soon saw two survivors in the water clinging to the broken off wing. Our skipper quickly sent off our boat, and they came back with two badly injured Japanese fliers who were brought aboard. One of the prisoners died after a few hours, despite the best efforts of our ship's doctor. Later, that evening, we transferred the other prisoner on a stretcher to the battleship USS New Mexico. On May 5, 1995, nearly 50 years later, I had the good fortune to meet with Kaoru Hasegawa, the Japanese Naval aviator who we had rescued there off Okinawa. Mr. Hasegawa, now a fit 71 years old, was in Washington, D.C., on a second visit to do research at the Naval Historical Center to learn more about the ships he encountered off Okinawa 50 years ago and what, exactly, had happened that day. He learned that the first ship he sighted after his arduous, sea-skimming flight from Japan's main island (and that fired as he went by) was the battleship USS West Virginia, and that is was the USS Callaghan that brought his plane down and then rescued and cared for him. He also learned that the cruiser he saw before crashing was the USS San Francisco. Ironically, the USS Callaghan was named after Admiral Daniel Callaghan, killed on the bridge of the USS San Francisco in a November 1942 naval battle off Guadalcanal. Today, Mr. Hasegawa is President of Rengo Company, Ltd., an international paper company with over 3,600 employees and affiliates throughout the world. He has a keen memory of that day, 50 years ago when as a Junior Grade Lieutenant in the Imperial Japanese Navy Air Corps, he set out to lead a group of 12 bombers to carry out kamikaze attacks against the U.S. invasion fleet off Okinawa. Now, he is eager to meet with survivors of the USS Callaghan and to honor veterans of both Navies. Mr. Hasegawa has visited and been interviewed at the U.S. Naval Institute in Annapolis, and he was warmly received at Washington's Navy Memorial. The USS Callaghan Survivors Association will commemorate the 50th anniversary of the loss of our ship to a kamikaze off Okinawa on July 29, 1945. Our reunion will be held in the great State of Tennessee at Pigeon Forge from July 26 to 29, where we will renew the "good times." Mr. Hasegawa and his wife are making a special trip from Japan to meet the crew that made his life possible. He too is a Callaghan survivor. Thanks to Leo Jarboe for contributing this story. 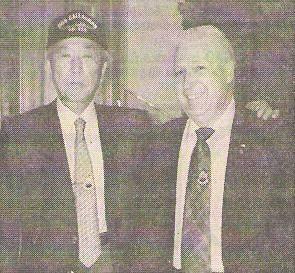 Leo was the first USS Callaghan survivor to meet Kaoru Hasegawa, and he invited the former pilot to the 1995 reunion of the USS Callaghan Survivors Association in Pigeon Forge, Tennessee.